The epigenome is composed of modifications to DNA that determine which genes of the genome are expressed or suppressed without changing the DNA sequence. While your genome is fixed, your epigenome is dynamic and flexible and responds to environmental stimuli. Gaining a complete understanding of epigenetics is necessary to control genetic behavior. 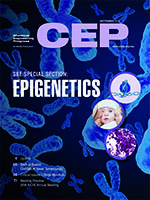 Read more in this month's special section on epigenetics. Other topics in this issue include: distillation tower turnarounds and critical issues. Process engineers are responsible for inspecting distillation columns. Follow this guide to prepare for a column inspection during a turnaround. This article discusses how rare earth elements (REEs) and precious and specialty metals — collectively known as critical materials (CMs) — are sourced as well as some issues and engineering challenges that may lie ahead. The epigenome is composed of modifications to DNA that determine which genes of the genome are expressed or suppressed without changing the DNA sequence. The complexity of the epigenome suggests a wealth of untapped biological information and regulatory potential that could be game changing for cellular engineering and biomedical interventions. Scientists must learn how to open and manipulate chromatin to gain complete access to eukaryotic DNA for genome engineering. This article highlights developments in single-cell epigenomic monitoring and modulating tools, as well as advances in synthetic epigenetic circuits. These tools are used in important biomedical and industrial applications. Harnessing and applying epigenetics in bioprocessing systems may improve cell line development, productivity, and product quality.